It’s been a good week for publications. On Monday, my story “Barefoot in the Guadalupe” appeared in Red Dirt Review, and the same day I got word that I’ll have a story in Scintilla sometime in the future. 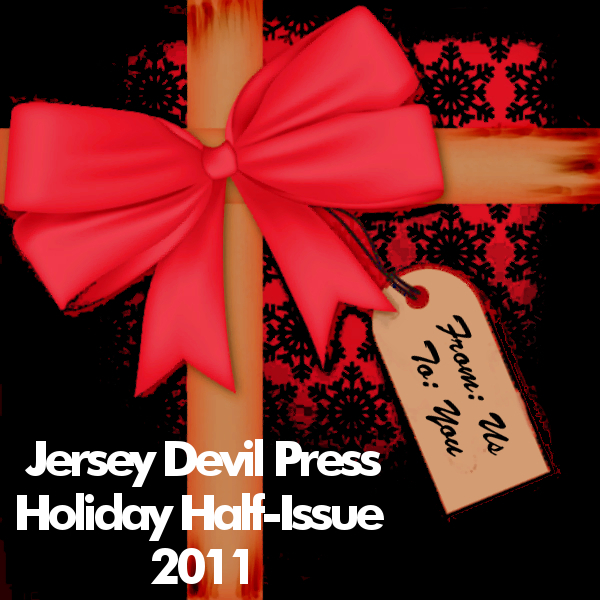 Then today, Jersey Devil Press‘s special Holiday Half-Issue my colleagues and I have been working on turned up online. And it is (in)glorious. Seriously: besides my story ripping apart Santa Claus and stitching him back together again (literally), the issue contains a delightful New Year’s story about obnoxious family and a magic genie hiding in a bottle of root beer, and two — count them! two! — stories about vengeful turkeys. Check out the issue online now. Because we need some new holiday bedtime stories. Who’ll get me a book I ain’t read…. I like genies and Christmas, sounds like a good book. I’m pretty proud of it, though publisher Eirik Gumeny did all the hard work, I think. Thanks! I had fun writing it, and I had even more fun reading the rest of the stories.